Pat Yarrington, CFO at Chevron, and Cynthia Bates, Vice President of Microsoft’s U.S. Small and Medium Businesses (SMB) Organization joined us today in Los Angeles for the Dialogue with Leadership at our MBA Women’s Conference. Dean Olian of UCLA’s Anderson School of Management hosted the conversation. Both speakers shared their tips for building a successful career. Pat suggested that MBA women focus on “STEM” (science, technology, engineering, and math) as a strong educational foundation for becoming part of tomorrow’s business leadership. Cynthia echoed that. “Today, we all are masters of technology. It’s so much part of our daily lives and today’s businesses,” she noted, observing that a strong base in math, science, and technology lay the groundwork for a successful career in many sectors. On the topic of continuous improvement, Dean Olian asked both women how they continually improve themselves. Cynthia talked about studying other leaders, paying attention to what they do well, and asking for feedback. “It’s really important to know the conversations that take place about you when you’re not there. Know what your areas are for development.” Pat says that she finds it works well to ask for feedback immediately following a presentation or the completion of a major project, seeking out input on what you could have done better and how it went. After the conference, we’ll share a video with highlights of today’s Dialogue, including a one-on-one interview with Pat and Cynthia. Tell us what you heard at the conference! Twitter @fortefoundation, #MBAConf. More coverage to follow. The MBA Women’s Conference is just a few weeks away. This is a great time to start preparing for what will be a phenomenal opportunity to network, learn, and fully engage your MBA journey. To help you prepare, a group of past conference attendees spent some time discussing important things for you know before you go. Colleen McMullen, Executive Director of Diversity Strategies and Programs at Carnegie Mellon University’s Tepper School of Business gives a basic introduction to the conference program, speakers, panelists, and companies you will encounter at the conference. She follows up with questions to a student panel about what to bring, networking, and the company expo. The student panelists also offer words of wisdom and how to make the most of your conference experience. Every day, in my career as a Foreign Service Officer with the Department of State (DOS), I apply the skills that I learned and practiced in the Carlson School MBA Program and through the Carlson Consulting Enterprise consulting engagements. In eight years with DOS I have gone from being an entry level officer to the Deputy Chief of Mission (second in command after the Ambassador) in a U.S. Embassy. I attribute my speedy rise through the diplomatic ranks to the interpersonal, analytic, negotiation and political skills that I learned and honed at Carlson. Working for the government is the hardest job I have ever loved, and infinitely more challenging than private industry, but a Carlson MBA has helped me, as it will help you, to survive and thrive. I am currently Special Assistant to the Assistant Secretary for Administration. My portfolio includes the Offices of Operations, Global Information Services, Emergency Management, Presidential Travel and Foreign Service outreach. From August 2012, I will be the Deputy Chief of Mission at the U.S. Embassy in Bandar Seri Begawan Brunei. I have also served as Assistant General Services Officer in Kathmandu Nepal, Consular Officer in Kingston Jamaica, Regional Management Officer in Baghdad Iraq, and Management Officer in Lahore Pakistan. This career has given me some amazing stories and allowed me to play a role in history. The group photo below was taken when Secretary Clinton visited Lahore in October 2010. The second photo was taken in 2009 the day I helped to inventory the vault that contained Saddam Hussein’s seized treasures in order to turn them over to the Iraqi government. 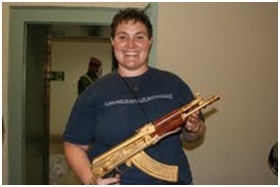 I especially like that I am wearing a CSOM T-shirt and posing with Saddam’s favorite gold gun. Communicate Yourself: There is only ONE secret to interview success. It’s easy to get lost in technique. Premeditating your personal stories does make it easier to tell them. Communicating yourself effectively does have an impact. Making eye contact and not saying “um” or “like” too much do send a certain signal. But all of that will happen naturally if you know this one secret. There is really only one thing that matters in a job interview. Ready for the secret? Here it is: YOU ARE GREAT. You are. Already. Just as you are right now. If you know that and believe it, the interview will be a success. Think about it. There you are forced into a small room for an extended period of time with one other human being – a stranger. It’s awkward and uncomfortable. Add to that the fact that they are supposed to be evaluating you and that you both have certain personal objectives riding on the interaction and it is a recipe for self-doubt, stifled expression, and preoccupation with everything but the conversation at hand. It’s easy to think that practicing more, memorizing more, and technique-ing yourself into perfection will make it go smoother. But in fact, we have found that instead of helping you relax into the conversation, ironically all of those things can increase the pressure and distract you even more from your only job in that room: SIMPLY BEING YOUR GREAT SELF. You won’t get every job you interview for: not every job is the right fit for you. But if you can truly be yourself during the interview, the conversation will be a success, you will make a meaningful connection with the interviewer, and the right jobs will find you. 1. Celebrate your awesomeness: This one is easy to do. Just look at your resume. Look at all of the awesome things you have dedicated your time to, the incredible accomplishments you have fought for, the specific and measurable impact you have had in the world. Take a few moments to just review and reflect right before you go into that interview room. Appreciate the person you are: the person who would take those actions, pursue those goals, and achieve those outcomes. Aren’t you just so proud to be you? 2. Appreciate your personal growth: If you are honest with yourself, there are places in life where you have failed. Yes you have. So have we all. It is part of life. But failure exists for a reason. It is there for our growth. Ever notice how success doesn’t really challenge us to stretch ourselves or expand beyond the boundaries of who we already know ourselves to be? A failure represents a place where we grew in life. That’s why interviewers ask about failure in the first place – because everyone wants to work with a failure. People who fail are people who grow. So celebrate your failures too for the way they have improved the person you are and expanded what’s possible for you. 3. Learn to brag: As women, we aren’t always the best self-promoters. But once you admit to yourself how great you are, you will want to share that with others in a way that feels good to you – or in other words, doesn’t FEEL like bragging. The key to doing this is the world’s oldest art form: storytelling. You can share any accomplishment – no matter how extraordinary in a way that makes you seem humble if you tell a story! Stories work for failure too. Please join us at this year’s Forte MBA Women’s Conference for our Communicate Yourself Workshop to learn more about how to tell a great story! Greetings from Nicole Bolton - See You in Los Angeles! Are you looking forward to sightseeing before or after the Forté Conference in Los Angeles this June? Los Angeles is a vibrant city with plenty of tourist attractions for you to see. Most visitors to the city take in the glitz and glamour of the entertainment industry with a tour of Hollywood. And others venture to Rodeo Drive in Beverly Hills to shop like a celebrity. But if you’re more interested in spending some time living like an LA-local, check out UCLA Anderson student Nicole Bolton’s recommendations for making the most of your time in Los Angeles. Just make sure to pack your sunscreen! Nicole Bolton is a Forté Fellow and MBA Student in the Class of 2013 at UCLA Anderson.